Boom! 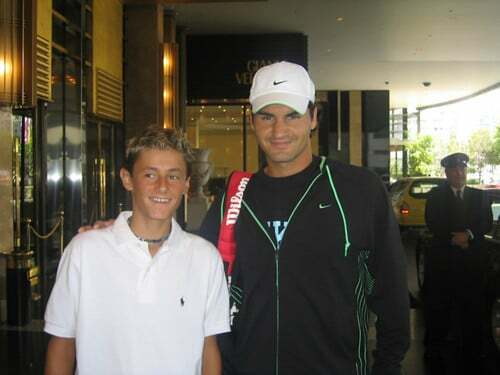 First class performance from Roger here to see off Australian hope Bernard Tomic. I predicted a straight sets victory and we got just that as Roger came through 6-4 6-2 6-2. It actually ended in a pretty brutal defeat for Tomic as Roger used all his shots and variety to bamboozle the 19 year old and not really give him a chance. The first set started out pretty tentatively, both players were feeling each other out and neither player went for too much. Federer made a few inroads into the Tomic serve, but the 19 year old held out until 4-4 where Roger fashioned a break and served out the set. Tomic competed quite well in the first set, and he noticeably flattened out his ground strokes compared to the match against Dolgopolov. However, he only chose to hit through the forehand from time to time and played too passively to cause Roger too many problems. The loss of the 1st set seemed to effect Tomic a little, Roger broken early to lead 2-1, broke again to lead 4-1, lost 1 break, broke straight back and served out the set 6-2. Roger had the measure of Tomic throughout the second set and mixed up his play too well, Tomic said before the match he would be able to get enough balls to Roger's backhand where he wouldn't be able to use it. This didn't happen and Roger had the upper hand in all of the rallies. I don't think Tomic moves great and Fed exploited this well, with changes of pace and throwing in the odd drop that that left the Aussie scampering towards to the net. By the third set Tomic looked tired and out of it mentally, he even mouthed towards his box “I can't do anything”. Roger took his foot off the gas at 2-1 and faced break points, but he dug out to hold and then broke again to lead 4-1. Tomic held to make 2-5 but Fed served out the match with ease to take it 6-4 6-2 6-2. I thought I played a really good match. I knew I had to, anything else and I wouldn't have got the job done. Overall, it was a great match from Roger, he never allowed Tomic to get into the match, and the fact he only had 13 winners and 0 aces across 3 sets is testament to that. Once Fed settled into a groove the match had an exho feel about it, and he pulled out some great shots – notably a backhand smash which is probably the hardest shot to play in the whole of tennis. Just like the match, Roger was equally brilliant in his on court interview with Jim Courier, paying Tomic credit, and praising his quarter final opponent, Juan Martin Del Potro, after the Argentine continues his return to form after a long injury. After seeing off Tomic, Roger now faces Juan Martin Del Potro, who secured his Quarter Final berth with a comfortable 6-4 6-2 6-1 triumph over German Phillip Kohlschreiber. Del Potro has picked up his game this week and his match today was pretty flawless – he hit a mere 12 unforced errors, and won 80% of points behind his first serve. He hasn't faced anyone of great quality yet though, and whilst Kohlschreiber is a talented player, he lacks the ability to get on top in rallies – and when that happens against Del Potro, you're in trouble. I make Roger the favourite heading into the match – it will be a tricky match, but if he applies himself like he did today against Tomic then I think he has too much. We saw today how effective the drop shot is against big guys that don't move forward that well, Del Po is of the same mould, and if Roger doesn't get into a baseline slug fest then he's a cert to make the semi's. Allez!